A scatter chart shows points arranged on a grid. tooltip – tooltip to show when hovering over the point. The x and y axes are mandatory, the others are optional. Each axis has a single column, except for tooltip which may list multiple columns. The column from which x axis or y axis values are to be read. x axis column defaults to 0, y axis column defaults to 1. Set to true to false to turn off the axis label. label for the axis. If not present, the name from the column is used. Column from which point labels are to be read. Optional. If not present, no labels are produced. Column from which point sizes are to be read. Optional. If not present, a size of 1 is used, which gives a standard size point. The value in the size column is proportional to the area of the point. 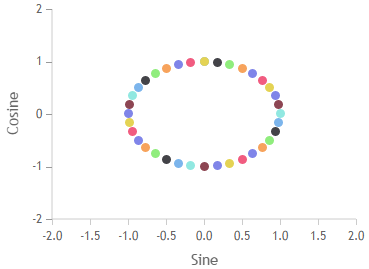 For example, a value four times higher will give a dot with double the diameter. An amount by which values in the size column should be multiplied before calculating the size of the point. For example, if you wanted the value 10 to give a standard size point, set this to 0.1. Column from which point colors are to be read. Optional. If not present, a default color or standard colors are used. The colors can be translated using the standard options.colors object. This allows a data column, such as a status, to be used to color the points. default Default color to be used when there is no color column, or for rows that do not have a value for the color column. This will also be translated using the standard options.colors object. One or more columns that will be used to create tooltips. Optional. If not present, no tooltips are produced. If there is a single column, the value of the column will be shown in the tooltip. If there are multiple columns, a table of values will be shown in the tooltip. 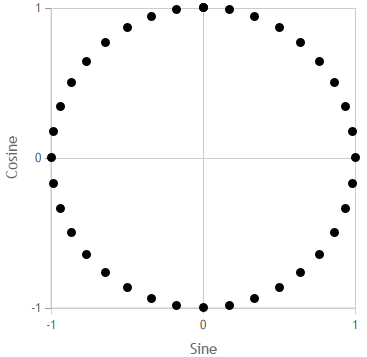 Consider a table which shows Sine and Cosine values for 10 degree intervals. Default options assign a color to each point and plot them against each other. You can clean up the display by setting height, min and max, ticks, gridlines and color. Consider a second table of nutritional information. Set min, max, ticks and labels for the x and y axes. Set the size of the points according to the calories, so that 10 calories per 100g would be a standard point. Set the color of the points according to the category column. The colors object is used to translate between these categories and real colors. Show the food column as a title. 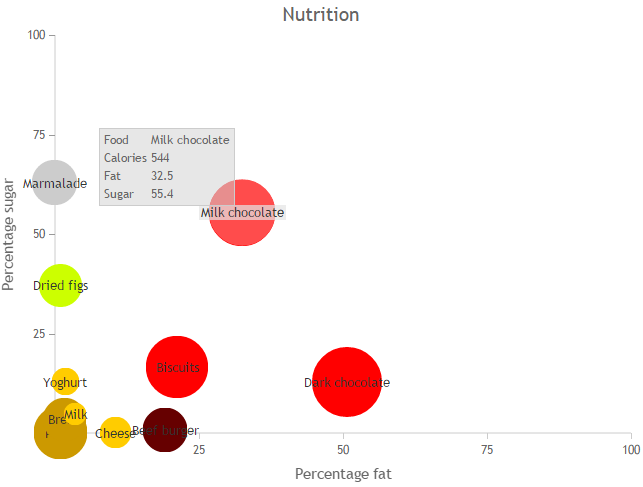 Build a tooltip from the nutritional information.